Graduated for my BSc (Hons.) & MSc (Hons) in Agriculture from University of Agriculture, Faisalabad, Pakistan in the year 1989 & 1991 respectively and for PhD and Post Doc. from Imperial College of Science, Tech. & Medicine, University of London, UK and University of Toronto, Canada, in the year 1996 and 2008 respectively. My research interest focuses on the control of plant diseases caused by whitefly-transmitted geminivirus pathogens (begomoviruses), based on an understanding of the mechanisms underlying the successful interactions between the components of these virus-vector-host complexes. (4) development of diagnostic tests for unidentified or new viruses and virus like diseases. (5) Use of fungus Aspergillus sp. and Bacteria for the cloning, expression and purification amylases enzymes. (6) Exploiting viral coat protein gene for vaccine production against animal and human viruses and development of resistant plants against plant viruses. I started my career as Research Officer (January, 1997) in the Centre of Excellence in Molecular Biology, University of the Punjab, Lahore, Pakistan and worked as Senior Scientific Officer (1998) in CCRI, Multan, Agricultural Officer (Plant Protection) Lodhran, Pakistan before joining as Asstt. 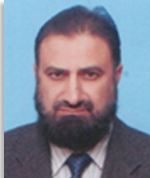 Professor (2003) in School of Biological Sciences, University of the Punjab, Lahore, Pakistan. I joined my current position as Professor (March 2010) and Director, Institute of Agricultural Sciences, University of the Punjab, Lahore, Pakistan. I have supervised two PhD students and five MPhil students, however, four PhD students and two MSc (Hons) students are currently enrolled under my direct supervision. I have almost 50 research publications in my credit, of which more than 30 are in impact factor journals. I have participated and presented research papers in about 30 National and International Conferences, Symposia and Workshops around the world. My research group has submitted over 35 full length viral sequences and approx. 15 partial sequences. One patent has recently been submitted. Future aims are to enhance crop yield and quality through Genetic Engineering approaches to meet the food demands of fast growing world population and to elevate the sustain livings of poor people worldwide. I have the honour to be the Editor-in-Chief of a biannual Journal Mycoptah, Managing Editor of Quarterly Agricultural News and biannual Herbal Heritage Report, published from University of the Punjab, Lahore Pakistan. Beside these I am also holding the office of the Vice President of Pakistan Phytopathological Society along with having membership of several other professional organizations, also serving as reviewer for many good repute National and International Scientific journals.